Brand new! Throw Blanket measures 50 x 60 inches. 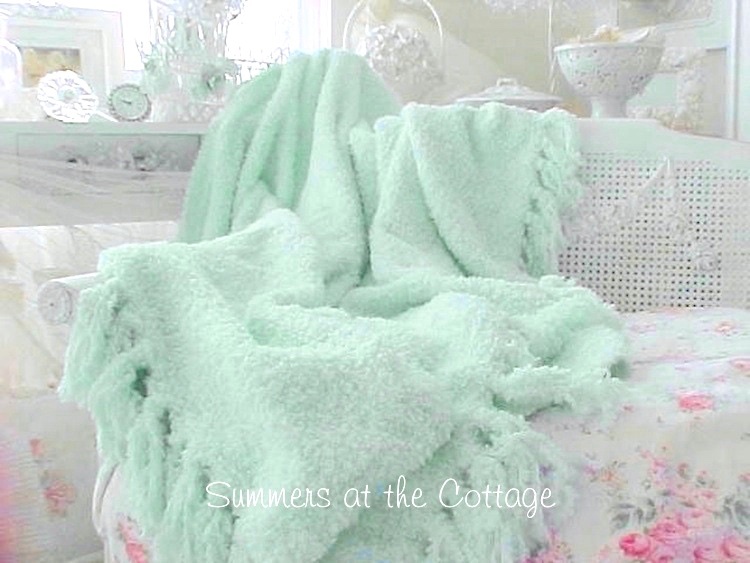 The perfect Cottage Aqua throw with chic fringe! This stunningly beautiful ultra cozy soft and fluffy throw is just the perfect accent to use on your bed, withe wicker chair or vintage settee and beautiful draped over an overstuffed chair or sofa. The color of aqua water for a tranquil relaxing way to cozy up in luxury with the softest fluffy throw! Not just for a beach house, but perfect in any decor! Shown below on a vintage pink roses cane chair with the old painted cottage furniture peeking through in the background to show how lovely this is for a shabby chic cottage home! Machine wash tumble dry. TO RECEIVE NEWS ABOUT NEW ARRIVALS & MORE! All rights reserved. Design, images, and text are subject to copyright protection.